Samsung released the Galaxy S6 Active in June 2015, shortly after releasing the Galaxy S6 and S6 Edge. 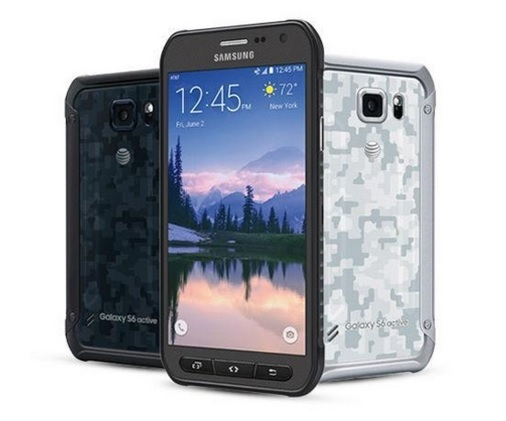 This Galaxy S6 Active currently runs on Lollipop and is available in camo blue, camo white, and solid gray. It has 32GB of internal storage and be externally expanded up to 32GB. The S6 Active is IP68 certified; dust and water resistant up to 1.5 meters and 30 minutes. The S6 Active has been tested against humidity, salt, dust, solar radiation, rain, and thermal shock. This model is designed to be used outdoors. You can use it in the rain, in a desert, in the mud or in the bathtub! This device has a 5’1″ super AMOLED touch screen with Corning Gorilla Glass and TouchWiz IU. It’s adaptive screen will adjust your brightness and contrast levels automatically no matter what lighting you’re in. The S6 Active also has a 16MP camera, with a 2160p video recorder, and a wide-angle lens 5MP front-facing camera. Get to your camera quicker by double-tapping the home key from any screen! The Galaxy S6 Active tops the market with its multitasking tools. Use two applications side by side with ‘Multi Window’. Multitask at the same speed with its octa-core processor and 3GB RAM. This model will have similar features to the S6 and S6 Edge; S-Voice, Smart Stay, and wireless charging – to name a few. New features include Samsung SideSync 3.0 (sync all your Samsung devices) and a built-in, defense-grade, anti-virus security system. Once unlocked, this device can be used with compatible GSM service providers around the world! Unlocking your Samsung Galaxy S6 Active is fast, simple and 100% guaranteed by Cellunlocker.net. Unlock your Samsung Galaxy S6 Active with Cellunlocker.net today and receive your network unlock pin on the same day! Why Unlock your Samsung Galaxy S6 Active with Cellunlocker.net? Unlock Your Samsung Galaxy S6 Active Today!